culture drawn from a rich heritage. The German countryside is lush and green with rolling hills. Though it rains often, Germany is a beautiful country with four distinct seasons. Germans love to be active outside. During the warm months, the lakes around Hamburg are filled with sailboats and the surrounding walkways are crowded with pedestrians, joggers, and bicyclists. Moods caused by seasonal changes are reflected in theatre, literature, and fine art. Germany has given birth to some of the world’s most celebrated composers, physicists, and philosophers. Germany’s artistic heritage is evident in its cathedrals, and other beautiful buildings. Though Germans welcome modernization, they are a proud people that work hard to uphold cultural traditions. On occasion they’ll even find a suitable reason to wear Bavarian Lederhosen and a Loden. Germany is typically a meat-and-potatoes kind of country. Lunch is the most important meal of the day though breakfast can be a very large meal. Beer is the national beverage and each region has their own distinct brewery. Hamburg’s brew, St. Pauli Girl, is exported internationally. Visit Hamburg and tastes Germany’s rich culture. Hamburg is a magnificent city for shopping. The city is well known for its elegant shopping arcades. 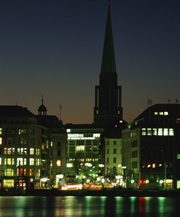 The main shopping area is located at the foot of Lake Binnenalster between Rathausmarkt and Jungferstieg. Here you’ll find designer boutiques, department stores and other fine shops in and around wonderful arcades. Mudsburger Centre, located north of the city center on Mundsburger Damm, is another popular shopping alternative. Read reviews for some of the best restaurants in Hamburg. You'll find the perfect restaurant for your vacation here. Choose a restaurant by cuisine type or visitor rating.